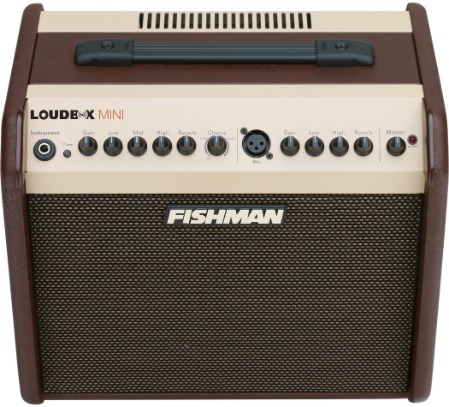 Loudbox Mini, Acoustic-Electric Guitar Amplifier from Fishman. The new Loudbox Mini weighs in at 20lbs with 60 watts of sound. Equipped with two channels and Fishman’s preamp and tone control designs, the Mini also includes digital reverb and chorus for the instrument channel, and reverb for the microphone channel. The Loudbox Mini also features an MP3 input and balanced XLR D.I. output, a must for jamming with others and recording your performances. The Instrument channel features include 3-band EQ with low, mid, high tone controls; a Reverb level control; dual-function Chorus and a feedback-fighting Phase switch; a ¼” input for active and passive pickups along with a 1/8” auxiliary input; a D.I. output and a balanced XLR output. The Microphone Channel features an XLR input for dynamic mics; 2-band EQ with low & high tone controls and a Reverb level control. Loudbox Mini is housed in a chocolate brown textured tolex enclosure with brown grille cloth and beige faceplate. 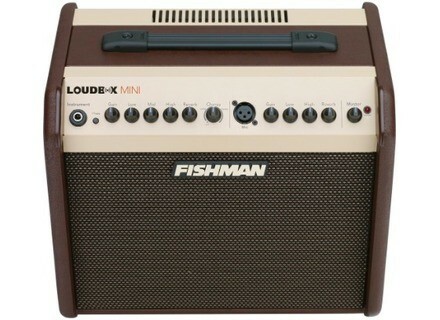 For more information about Fishman Acoustic Amplification, visit www.fishman.com. Rocktron Reaction Digital Delay Rocktron has introduced a new Digital Delay in its Reaction Series of stompboxes. Big Lou Guitars Wide Nut Big Lou Guitars developed the Big Lou Wide Nut guitar with extra wide fretboards and nuts to accommodate those with bigger hands and fingers, and the wider string spacing offers room for playability and accuracy.